Release: 1987 Absolute Entertainment Inc. 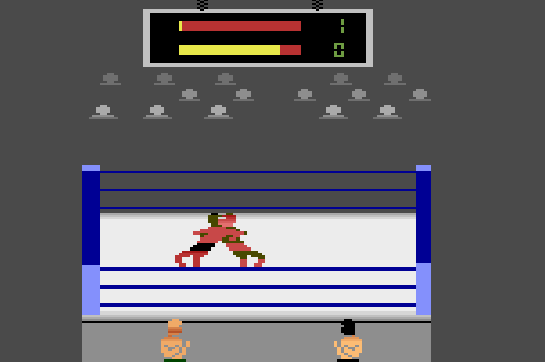 Using the random number generator (RNG) from Random.org and a list of 523 games for Atari 2600, Title Match Pro Wrestling was chosen for review. Well, it's a wrestling game, but for a controller with only one button and a joystick it surprisingly has a lot of variety with what you can do. All of your moves are done by pressing the button and a direction, with many of the moves being context sensitive. For example, if you hold the button and press up, you'll punch, but if you have your opponent in a hold or on the ground, pressing button and up results in lifting them over your head. 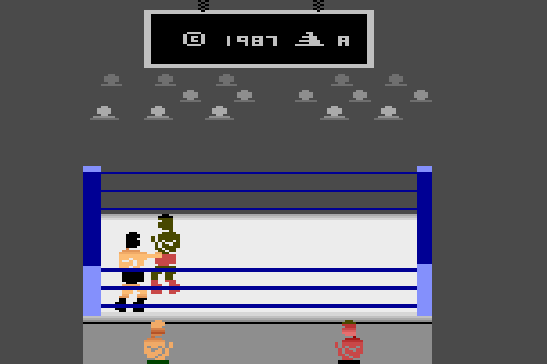 Or, if your opponent is down and you're near the ropes at the top or bottom of the screen, the same button and direction combination will let you climb onto the ropes from which you can then slam down onto your opponent. Apart from those moves, you can also spin your opponent around and throw them and, of course, pin them down for the win. In order to successfully pin someone, you'll want to weaken their strength meter. When you're actually pinning them, they can try to escape by wiggling the joystick faster than you wiggle your joystick, but if they have relatively lower strength than you, they'll be at a disadvantage. Strangely though, most of the cooler offensive moves actually decrease your own strength so there isn't much point in using them. Also, to get someone pinned, you'll first have to grab them and throw them down, but since you have to be so close to them to do this and must first release the joystick before pressing the button and the direction, it's very hard to accomplish it when you need to. The game moves at a pretty fast pace, so like most modern fighting games (grumble, grumble), this one is likely to turn into a mash fest. In my experience, both players will be out of strength in no time and any potential strategic depth there might have been gets thrown out the window. There are four playable characters, but they all seem to function the same way. 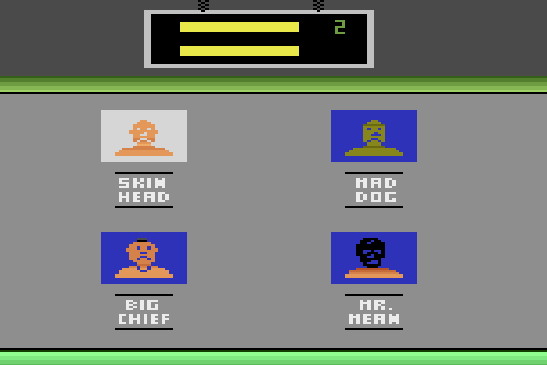 By pressing Select on the console, you can cycle between 1 on 1 or 2 on 2 tag team versus either another player or a computer. Tag team adds a bit more depth because you can swap out with your other guy to recharge your strength, or try to keep your opponent away from the side to prevent them from tagging out. The computer player has predictable and repetitive movement, but is so fast at attacking that they're a beast to fight even when you know where they're going to go. And as for animation and audio, it's about what you'd expect from the Atari 2600's limited hardware. The applause sounds like static, the animation is stiff (but not that bad, all things considered), and that's about all there is to it. I recorded some gameplay below, so you can see it in motion. The Final Word: For an Atari game, there's more depth here than you'd expect and than there appears to be. Unfortunately, it's unlikely that anyone will ever fully make use of that depth because it's much easier and more effective to just mash buttons. There you go. That's Title Match Pro Wrestling. If you're into retro games, check out Itadaki Street. It's pretty great. Twitch.tv/Linkums - Watch me play live! @WTCGames - Get updates about new posts, videos, and live streams!